The Purosol PUOC-10041 Sport/Marine Cleaner was developed for NASA and the US military to address the cleaning needs of optical and electronic screens and outdoor gear exposed to marine and other harsh and rugged outdoor environments. Combining the power of organic plant extracts and state-of-the-art green chemistry Purosol Sport/Marine is the world's most advanced cleaning solution. Using the latest in surface chemistry, it breaks the molecular bonds that dust, dirt and grime use to adhere to the screen surface, and actually breaks down the crystalline structure of salt molecules and other organic compounds. 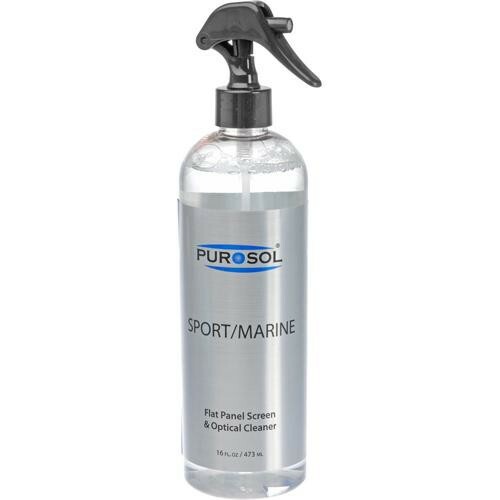 Purosol Sport/Marine is streak-free and leaves an anti-static barrier which repels dust and deters the formation of salt crystals, meaning you will have to clean your gear less frequently. Gentle enough for use on all marine displays, coated lenses and other outdoor equipment. Powered by organic plant extracts, it contains no alcohol, ammonia, detergent, or any other traditional solvent which can damage your expensive displays or gear. Purosol leaves no residue and is free of silicone, graphite and glycerin. Taking its cleaning power from nature itself, Purosol Sport/Marine is non-toxic, hypoallergenic, nonflammable, sterile and completely biodegradable. It is CFC-free, VOC-free and exceeds EPA and OSHA health and safety standards, as well as exceeding standards set for the EU, Australia, Canada, Japan, and other countries worldwide. Utilized by the US and Canadian militaries, commercial and private fishing vessels, yachts and tournament fishing boats, marine research vessels and ski patrols. Purosol is trusted on the very best and valuable marine electronics and optics in the world. Box Dimensions (LxWxH) 9.35 x 2.45 x 2.4"